Ravelry (for those not in the know, Ravelry is sort of like Facebook for knitters) has a new feature, which shows the “hot patterns” at any one moment. It is subtitled “Designs that Ravellers are looking at today”. It is a very good way to track trends that hit the knitting world, and when one is bored, it is an incredible time sink, as you can chart the progress of a particular pattern up and down the popularity ratings. This list does not show which patterns are being knit the most, but rather which garner the most hits on Ravelry, and the list is constantly updating to reflect new viewing patterns. As a scientist, I find I am fascinated by seeing how networking on these large social sites can influence which patterns get seen the most. It is like charting the activation patterns in neural networks (my day job seeping into my knitting world). One of the trends I am finding particularly interesting at the moment is the rise (and rise) of the cowl. I just checked the top 100 “hot patterns” on Ravelry this moment, and 12 of them were cowls. They didn’t have this feature last year, but I am fairly certain that if we were to go back to a year ago, this wouldn’t be true. (In fact, I think a year ago, we would see socks. And more socks. More on this below.) I cannot claim to be immune to this trend, having just knit a cowl for the first time in my 40 year knitting career. (And a very nice one too. In fact, I am wearing it now as I type.) So, can we tease apart some of the reasons behind the exploding popularity of the cowl? 1. Christmas is fast approaching, and knitters are desperate to fit in one last hand knitted gift, particularly for the hard to please (teenaged daughters, anyone?) While some cowls are incredibly intricate and time consuming, some of the most popular cowls use very chunky yarn on very big needles, and qualify as speedy knits. 2. Cowls are everywhere. This is not a case of familiarity breeding contempt. Fashion tends to work by saturating the market with one particular trend, until the anti-trend can be dusted off and emerge (like the ever flowing tide changes between high waisted and low waisted trousers; and on that note, I for one am cheering to be able to finally find high waisted trousers in the shops). Cowls are not only prominent on knitting sites, but are on all of the runways and in all of the shops. You cannot escape the cowl this year. 3. One of the truisms of hand knitted sweaters these days is that you can buy a machine made sweater in a shop for considerably less than most hand made sweaters cost to make. The sweater that may cost 30£ in the shop can easily use 60£ (or more) worth of wool. The cowls which seem to be ubiquitous in the shops this year are one of the few examples of the opposite: to most knitters store-bought cowls seem outrageously over-priced. They are almost always made with little artistry, and boring patterns and use a poor quality of yarn. Not only can you make a far nicer cowl than you could find in a shop, but you can do it with cashmere, or double Malabrigo, or a fabulous hand dye, for the same price! 4. There are no fit issues involved with a cowl. It is hard to gift a perfectly fitting sweater; fit is tricky and demands careful measuring. A cowl is sure to fit everyone. 6. Are there any other mothers out there who always imagine long scarves being caught in bus doors, car windows, revolving doors etc? The type who fret continually about some threat or another? The kind for whom Isadora Duncan is a cautionary tale? For all of us who fall into this slightly obsessive category (who shall again remain nameless): I have never heard of someone being decapitated by a cowl. I just finished casting-off the Gap-tastic cowl and it’s a total winner! I love it! Using 2 strands together was brilliant – just what my colourway needed to even things out. Thank you thank you thank you! And I completely agree with you on the above – a person can’t own enough cowls – and who wants to die like poor Isadora? 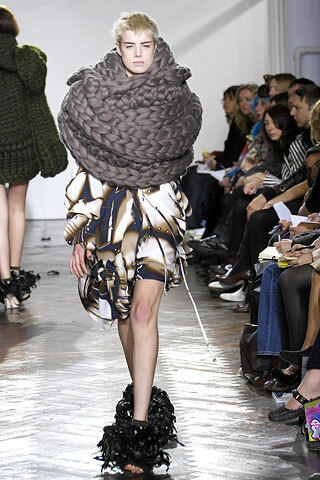 I’d much rather be suffocated by roving knit on broom poles – much like the fashion-show model LOL!